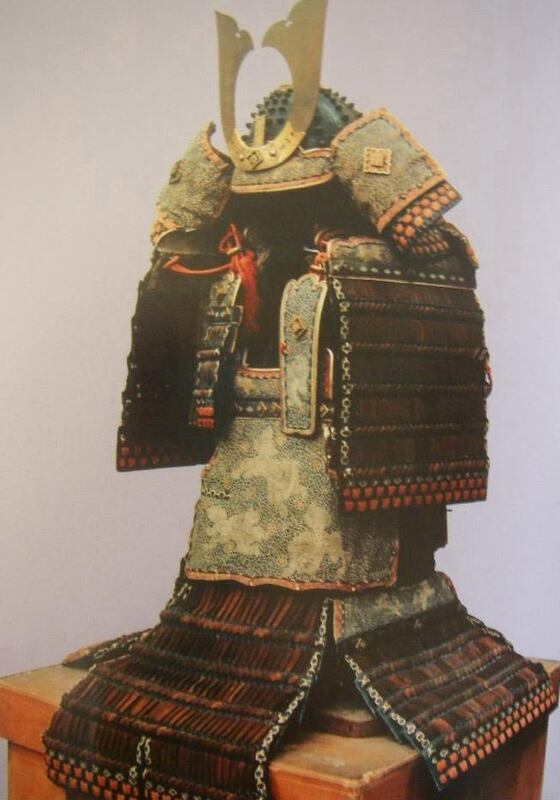 The armour tatenashi no yoroi (楯無鎧, see picture above) was once worn by Minamoto Shinra Saburō Yoshimitsu (源新羅三郎義光, 1045-1127), the ancestor of the Takeda family. Yoshimitsu´s son Minamoto Kurogenta Kiyomitsu (源黒源太清光, 1110-1168) gave it, together with his banner, to his son Takeda Nobuyoshi (武田信義, 1128-1186) in Hō´en six (保延, 1140), who was the first to take the family name Takeda. 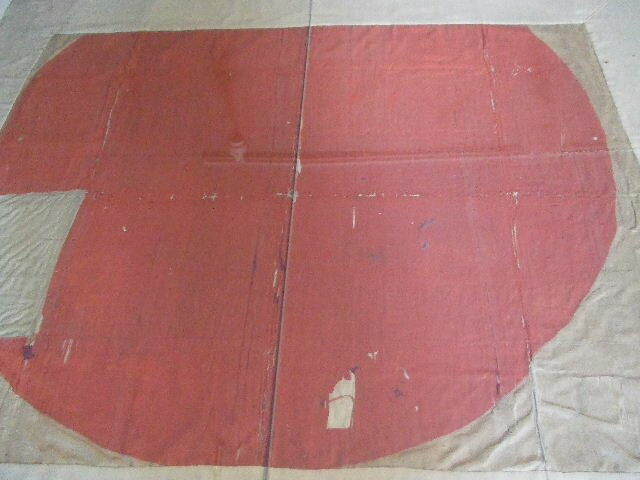 The banner by the way (see picture above) is the oldest extant banner which shows the rising sun (hinomaru, 日の丸), the present-day national flag of Japan. In this context – it was the genpuku ceremony – Nobuyoshi received from Minamoto no Tameyoshi (源為義, 1096-1156) a tachi called Tora-maru (虎丸). According to tradition, this sword was a heirloom of the Minamoto but the whereabouts of it was already unknown at the time of Shingen. Thus it never appears again in any documents. The horse Onikage belonged to Shigen´s father Nobutora (武田信虎, 1494-1574). Nobutora too had a penchant for swords. His favourite piece was an oversized ō-katana of the Bizen-Osafune smith Kanemitsu (兼光) which had, according to the Kōyō Gunkan, a nagasa of 2 shaku 9 sun (~ 87.9 cm). In 1897 the journalist and sword collector Takase Ukō (高瀬羽皐, 1853-1924) discovered a blade at a sword dealer in Tōkyō´s Akasaka district (赤坂) which bore the following signature: “Bizen no Kuni Kanemitsu – Nobutora-shoji – Tenbun hachinen sanzun-age” (備前 国兼光・信虎所持・天文八年三月三寸上, “Bizen no Kuni Kanemitsu – owner Nobutora – shortened in the third month of Tenbun eight  by 9 cm”). The blade had a nagasa of 2 shaku 6 sun (~ 78.8 cm), several nicks, and traces of an arrow impact in the hi, that means it was surely used in one or more battles. Of course the supplement “Nobutora-shoji” is no definite proof that the sword was really in the possession of Nobutora. Takase did some investigations and asked the historian Naitō Chisō (内藤恥叟, 1826-1902). *1 The latter found out that the Ashida were custodians of the Suzuki family (鈴木), who were in turn castellans of Mito Castle (水戸城) and members of the elders of the Mito fief. This tallies with a letter of Hon´ami Chikatoshi (本阿弥親俊)*2 where he also mentions that the blade had been in the possession of the Suzuki family for several generations and that it shows traces of an arrow impact in the hi. Suzuki Iwami no Kami Shigemune (鈴木石見守重棟, 1839-1868) sided with the bakufu during the Meiji era and was killed by sonnō-jōi troops. Prior to that he had given the Kanemitsu to his father who was able to escape. From the estate of Shigemune´s father it eventually went to Takase Ukō. The Yoshihiro tachi mentioned at the beginning of this chapter is probably the Kai-Gō (甲斐郷) or Kai no Kuni Gō (甲斐国郷) as it is listed in the Kyōhō Meibutsu Chō (享保名物帳). *3 Therein it is described as follows: “fuchi-yuisho, shinogikado ni hosoki-hi ari kore, kobore ari” (不知由緒、鎬角に 細き樋有之、こぼれ有, “unknown provenance, narrow hi along the shinogi, nicks [on the cutting edge]”). The blade is listed with a length of 2 shaku 1 sun 3 bu (~ 64.5 cm). A drawing (see picture below) of the Kai-Gō is found in the Hon´ami Kōtoku-oshigata“ (本阿弥光徳押形), an oshigata collection by Hon´ami Kōtoku (本阿弥光徳, 1553-1619). On the basis of the position of the carving of the stylized suken (素剣) on the tang it can be assumed that the blade was greatly shortened. That means the suken was once a horimono on the shinogi below of the narrow hi. Kai-Gō from the Hon´ami Kōtoku Oshigata. Obata Kagenori (小幡景憲), one of the compilers of the Kōyō Gunkan, writes that the tachi had once a nagasa of 2 shaku 9 sun (~ 87.9 cm) and that Shigen had it shortened to 2 shaku 7 sun (~ 81.8 cm). The reason was that Shigen wanted to harmonise the numerical values of the blades length with those of the lunar calendar. The latter is namely divided-up into 27 sections (nijūnana-shuku, 二十七宿) so, according to Kagenori, he wanted the sword to be listed with a 2 and a 7 in the records and not with a 2 and a 9. If this sword is the Kai-Gō then it was later again shortened to 2 shaku 1 sun 3 bu (~ 64.5 cm), the dimensions with which it is listed in the Kyōhō Meibutsu Chō. The Shinchō Kōki (信長公記), the Edo-period chronicle on the life of Oda Nobunaga, describes in the history of the Kai-Gō that it was worn by Takeda Katsuyori (武田勝頼, 1546-1582), Shingen´s son, to the bitter end when he was defeated by Nobunaga and Ieyasu at the Battle of Tenmokuzan (Tenmokuzai no tatakai, 天目山の戦い) in 1582 and forced to commit seppuku. In this context the sword came into the possession of Nobunaga who called it Kai-Gō and who later presented it to Ieyasu. Ieyasu in turn presented it to Toyotomi Hideyoshi as a peace offer when both encountered each other in 1584 at the battles of Komaki and Nagakute (Komaku-Nagakute no tatakai, 小牧・長久手の戦い). Hideyoshi gave it to Mōri Terumoto (毛利輝元, 1553-1625) who sided against Ieyasu but did not participate in the Battle of Sekigahara. As a kind of compensation for “being on the wrong side,” he presented the sword to Ieyasu. But other sources are contradictory. The Randai Hikki (蘭台筆記), for example, says that Hideyoshi got the sword in 1583 from a certain Takigawa Kazumasu (滝川一益, 1525-1586). Kazumasa was in the vanguard of Nobunaga when Katsuyori was defeated and the Shinchō Kōki says that it was his task to prepare the body for the inspection by Nobunaga. But it is unlikely that he just stole the sword from the dead Katsuyori. Later it also appears in a list which deals with the estate of Hideyoshi. The exact wording is: “Yoshihiro, katana, Etchū no Saishō Toshinaga” (吉広、刀、越中宰相利長). The document uses the wrong characters for the name of Gō Yoshihiro (郷義弘) but this was not uncommon back then. 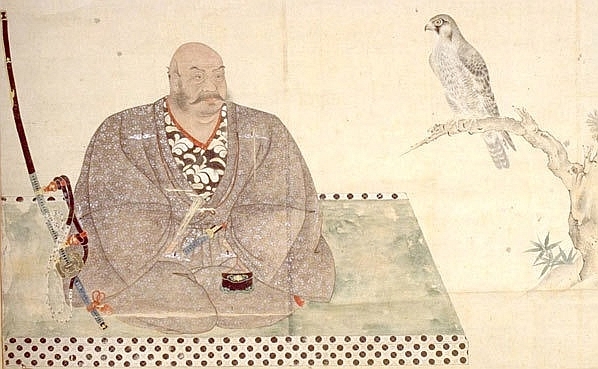 Etchū no Saishō Toshinaga refers to Maeda Toshinaga (前田利長, 1562-1614). However, genealogic records of the Maeda family say that this entry does not refer to the Kai-Gō but to another meibutsu, the so-called Tomita-Gō (富田郷, see picture below). This is insofar sound because the Tomita-Gō had continuously been in the possession of the Maeda until the end of the Edo period. Another tradition says that Takigawa Kazumasa received the sword from Nobunaga for his military achievements at the Battle of Tenmokuzan and that Kazumasa presented it later to Ieyasu. It is then said that Ieyasu ordered the shortening from 2 shaku 7 sun (~ 81.8 cm) to 2 shaku 1 sun 3 bu (~ 64.5 cm) because the blade had been damaged during the battle. Later Hideyoshi suggested that Ieyasu gives him the Kai-Gō in exchange for his half-sister Asahi-hime (朝日姫, 1543-1590)*4 and the meibutsu Fudō-Kuniyuki (不動国行) to strengthen their alliance. The rest of this version corresponds to the other one, namely that the sword went from Hideyoshi to Mōri Terumoto who returned it to Ieyasu after Sekigahara. That the Kai-Gō was still in the possession of the Toyotomi after Hideyoshi´s death is proven by Hon´ami Kōtoku´s Hon´ami Matasaburō (本阿弥又三郎), a catalogue of the treasure swords of the Toyotomi, compiled in the fifth year of Keichō (慶長, 1600). Therein we find the following entry: “Kai no Kuni Gō, katana” (甲斐国 かう、刀). *5 Maybe it passed via Hideyoshi´s successor Hideyori (秀頼, 1593-1615) into the Tokugawa family because Hideyori was married to Hidetada´s daughter Sen´hime (千姫). The Kai-Gō is listed in the Kyōhō Meibutsu Chō, in the section on blades damaged by fire, the so-called yakemi (焼身). It fell victim to the great Meireki fire (Meireki no taika, 明暦の大火) which destroyed almost 70% of Edo in 1657. Later, i.e. after the Kyōhō era, it was successfully re-tempered. After World War II the sword was thought to have been lost but was supposedly rediscovered in the Museum of Fine Arts in Boston. 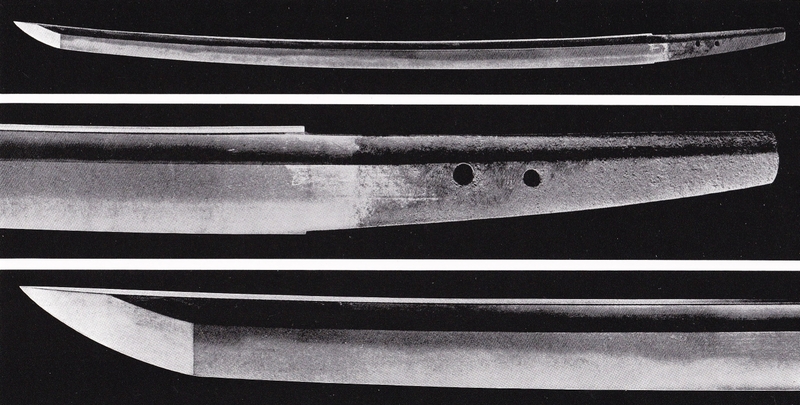 The second treasure sword that Takeda Shingen asked for at his coming-of-age ceremony was a wakizashi by Samonji. Samonji, also called Sa (左) or Ō-Sa (大左), was a smith from Chikuzen province and, according to older traditions, a student of Masamune. A legend says that Samonji´s blades soon became sharper than those of his master which resulted in Masamune heading for an official post at the bakufu in order to expel Samonji from Kamakura. Well, Samonji returned to Sagami province and secretly forged from the outskirts of Kamakura, but as it was dangerous for him to be there without permission he left his blades unsigned. In the Kōyō Gunkan we read that Shingen presented a tachi by Yoshihiro and a wakizashi by Samonji to Nobunaga´s son Oda Nobutada (織田信忠, 1557-1582) when the latter became engaged with his daughter Matsuhime (松姫, 1561-1616) in Eiroku eleven (永禄, 1568). But the marriage never took place because things between the Takeda and the Oda developed in an “unfavourable direction.” The tachi by Yoshihiro was not the Kai-Gō because the latter went later to Shingen´s son Katsuyori. The wakizashi by Samonji was surely also not the treasure sword because Shingen would never have given this heirloom as an engagement present. There were also several Masamune in the possession of the Takeda family. A wakizashi measuring 1 shaku 3 sun (~ 39.4 cm) of that great master was worn by Shingen shortly before his coming-of-age ceremony, i.e. at about the age of twelve or thirteen when he still bore his youth name Katsuchiyo (勝千代). One day the young Katsuchiyo re-enacted on his wooden horse the great battles of his ancestors when the toy suddenly started to speak: “Do you already know the art of war?” Shingen was not a shy kid and answered: “Of course I know them!” “So what art of war do you know?,” asked the wooden horse but Katsuchiyo jumped out of the saddle, drew his wakizashi, yelled “This one!,” and cut off the head of the horse. When he examined both parts they turned into an old tanuki (狸), a Japanese raccoon dog which is known as shape shifter. Thereupon Katsuchiyo gave the blade the nickname Tanukimaru-Masamune (狸丸正宗). Drawing of the Kusakiri-Masamune from the Hon´ami Kōetsu Oshigata. Ichihei, probably a person from the vicinity of Sanada, refers to Ittokusai Yukitaka (真田一徳斎幸隆, 1512-1574), who was one of Shingen’s major generals. *7 But it is unclear who was rewarded and who was Saburō. Yukitaka distinguished himself some time before in 1550 at the siege of Toishi Castle (戸石城) and also participated in 1553 at the First Battle of Kawanakajima (Kawanakajima no tatakai, 川中島の戦い). A theory says that Saburō refers to Hōjō Saburō (北条三郎, 1554-1579), the seventh son of Hōjō Ujiyasu (北条氏康, 1515-1571), who was adopted by Shingen for a while. But the adoption was dissolved later and, via an “intermediate adoption” by Hōjō Gen´an (北条幻庵, 1493-1589), Hōjō Saburō ended up the adopted son of Uesugi Kenshin (上杉謙信, 1530-1578) and received the name Uesugi Kagetora (上杉景虎). But he was only four years old in Eiroku one. It is said that Shingen wore at one of the Kawanakajima battles another blade by Masamune, namely the meibutsu Hoshizukiyo-Masamune (星月夜正宗). Hoshizukiyo means “a starry night,” or to be more precise, a “night where the stars shine as bright as the moon.” However, the circumstances of the naming are unknown. Either he wore the sword during a starry night or some of the blade’s characteristics looked like shining stars. According to the records of the Tsuchiya family (土屋), who owned the Hoshizukiyo-Masamune after World War II, the Ashikaga-shōgun Yoshiteru (足利義輝, 1536-1565), trying to make peace between several daimyō like the Takeda and the Uesugi, gave it to Shingen during the early years of the Eiroku era (永禄, 1558-1570). After the destruction of the Takeda, the sword was handed over to Tokugawa Ieyasu who presented it to his sixth son Matsudaira Tadateru (松平忠輝, 1592-1683) in Keichō 15 (慶長, 1610) when he appointed him daimyō of Echigo´s Takada fief (高田藩). But Tadateru showed improper behaviour during the summer campaign against Ōsaka Castle and was reprimanded by the Tokugawa family. One year later his older brother Hidetada decided to confiscate all of Tadateru´s lands and to ban him to Asamayama (朝熊山) in Ise province. The Hoshizukiyo-Masamune was confiscated too and given to the Mito branch of the Tokugawa. There it remained until the death of Tokugawa Yoshiatsu (徳川慶篤, 1832-1868), the next to last daimyō of the Mito fief. When Yoshiatsu´s estate was divided-up the sword came into the possession of his younger brother Tsuchiya Shigenao (土屋挙直, 1852-1892) who was lord of the Tsuchiya fief neighbouring Mito. *8 After World War II the Tsuchiya had to sell it but the present-day owner is unknown. The blade was sometime shortened to an ō-wakizashi measuring 58.7 cm with a bōhi on both sides and a sori of 0.9 cm. There existed an old accompanying letter which attributed the blade with a value of 5.000 kan. Yoshikawa Kentarō (吉川賢太郎), from the NHTK, who was entrusted with the care of the sword in the Tsuchiya family after the war, once said that the blade was probably not a Masamune and the selection as present for Shingen shows us the scarce financial situation of the Ashikaga at that time. Incidentally, the blade was attributed to the Hasebe school (長谷部) by the Hon´ami family during the Edo period and, later during the Meiji period, to the Osafune smith Kanenaga (兼長). *9 This speaks for Yoshikawa´s doubt about the attribution to Masamune. *1 Naitō Chisō had studied under Fujita Tōko (藤田東湖, 1806-1855), the father of Fujita Koshirō introduced in the previous chapter. *2 Chikatoshi´s Hon´ami name was Kōso (光蘇). *4 Asahi-hime was Ieyasu´s second wife he married after Tsukiyama-dono (see this story). *5 The name Gō is mentioned in this catalogue in the archaic notation “Kau” (かう). *6 Harunobu was Shingen´s name after his coming-of-age ceremony. Shingen was the Buddhist name he used from 1559 onwards. This means that the letter from 1558 at least corresponds to the historical facts. If it had been signed Shingen then it would be an obvious forgery from later years. *7 Yukitaka´s fourth son Nobutada (信尹, 1547-1632) also bore the first name Ichi´emon no Jō (市右衛門尉). So it could be that the letter was addressed to Nobutada. But the latter was just eleven years old in the first year of Eiroku (1558) which speak against a reward for military achievements. *8 The Tsuchiya were retainers of the Takeda during the Sengoku period. *9 Kanenaga was active around Jōji (貞治, 1362-1368) and was a student of Chōgi (長義).